Put a bulletin board on your wall and make it a happiness board. I’ve always had difficulty with personal “deadlines” and “goals”. I wave at them as they pass by unfinished or, in most cases, not even started. However, I have found a way to turn my wants, needs and desires into visual reminders. I’ve learned that the more my mind is reminded of something in a pleasant, pressure free way, the more likely I am to do it. Because of this I created a visual “happiness board”. It’s on the wall just above my desk where I write every day. When I was writing One Boy’s Struggle, I created a mock-up cover and pinned it to my happiness board. I set no deadline to complete the book, but somehow that picture reminded me every day that I would finish it and, I did! Too simple, right?! That’s the point. Deadlines and specific goals fill me with unneeded pressure and are over complications to something that can be so much simpler and pleasant. Pictures of places I want to visit are on my happiness board, too. I’ve visited many of them thanks to my board (The Mona Lisa rocks!). Many things I want to accomplish are represented in pictures on my board. A happiness board with compelling, wonderful, exciting pictures is a way to set my mind in motion and gently remind myself of what is important to me. 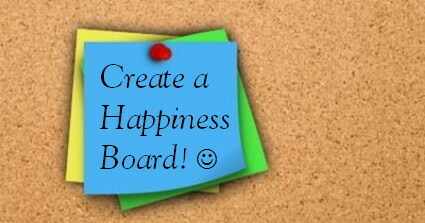 How about creating your own happiness board? You know what else is wonderful about it? There’s no requirement to believe it works. Simply enjoy the pictures and allow them to make you happy every day anyway. If you want more tips on How to be Happy Every Day: Click Here to download the free eBook! Share it with your friends too, because we all deserve to be happy, every day! Next post: What is your life’s purpose? Let’s find out! Even if you have ADHD!